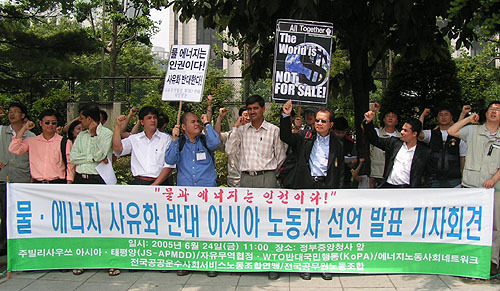 From 20th to 24th June, 2005, Jubilee South APMDD, KoPA, Korean Public Services Union and Korean Government Employees Union organized "International Trade Union Conference against Privatization of Water and Energy". There were meetings, workshops, seminars and press conference to discuss and reiterate the opposition against privatization of public utilities in the region. Below is the declaration from the participants. Water and Energy Are Human Rights! We are workers and activists from Thailand, the Philippines, Indonesia, India, Nepal and Korea. We participated in the 'International Trade Union Conference against Privatization of Water and Energy' held in Seoul from 20th to 24th June 2005, and had clearly voiced out our opposition and discussed alternatives to privatization of public services that is being enforced all around the world, particularly in Asia. In particular, we focused on privatization of water and energy, which should be guaranteed as basic rights of the people, and agreed we will intensify global resistance against privatization and neoliberal globalization. Water and energy are human rights. All peoples have the right to accessible, clean water and stable electricity. Water and energy as rights should be guaranteed to all, equally, which is why states have directly managed these services. Corporations, which place priority on profit, cannot guarantee necessary public interest. However, our governments are selling off our water and energy to private companies, in neglect of their obligations. Our rights are being degraded for the interests of big businesses and international financial institutions. International financial institutions such as the International Monetary Fund(IMF), World Bank and Asia Development Bank(ADB) with support from transnational capital, as well as creditors using debt as leverage, enforce neoliberal restructuring policies and are turning over water and energy to private capital. Furthermore, the World Trade Organization(WTO) along with regional and bilateral free trade agreements, under deceptive rhetoric of 'free trade', promote privatization and marketization of all public services. We are against the inclusion of services in the WTO. The General Agreement in Services in Trade(GATS) demands that we turn over education, healthcare, childcare, water, environment and all energy sources to the logics of the market. In addition, transnational corporations and international financial institutions are abusing the Tsunami, which had taken away tens of thousand of lives in many parts of Asia, and are enforcing restructuring under the name of 'aid' and privatizing public utilities under the name of 'reconstruction'. Furthermore, we denounce the collusion and collaboration between our national governments, big corporations and the international financial institutions. As a consequence, workers and ordinary peoples lack water to drink and are threatened from instability of electricity provision. Weren't California and India hit by several electricity crises as a result of privatization brought on by Enron? Didn't the Bolivian people resist against privatization of water and the resulting price hikes? Aren't they now rising up against their government calling for re-nationalization of their energy sources? Aren't workers and people of India, Nepal, Philippines, Indonesia and many places around the continent suffering from profiteering by transnational water corporations such as Bechtel, Suez and Vivendi? Aren't the Philippine people suffering from price increase of 400% in water prices? Aren't Thai workers mobilizing broad campaigns against electricity privatization in their country right as we speak? We are also seriously concerned about the 'Framework Act on Energy' that the Korean government is promoting. The proposed Energy Basic Law is one that aims to restructure the energy industry and to promote privatization and marketization. We are also well aware that water distribution is being commissioned to private corporations now in Jeonju, following similar projects in Seoul and Masan, as a way of privatizing water in Korea. The Framework Act on Energy and outsourcing of water distribution to private capital must be stopped, and we convey our solidarity and support to the Koreans who are struggling against privatization of water. Through this 'International Trade Union Conference against Privatization of Water and Energy', we had once again confirmed that privatization of water and energy is a challenge that we face in all over Asia, and we had resolved to strengthen international solidarity and to mobilize joint actions. We resolve to struggle against transnational capital, international financial institutions such as WTO, IMF, World Bank and Asia Development Bank and the privatization policies that they impose. We also strongly condemn attempts to use the Tsunami disaster for business interests. We will struggle against the APEC summit that is scheduled to take place in Pusan, Korea, and we will meet in Hong Kong in December to fight against the WTO. We will strive forth to build an environmentally-friendly, equitable and just society, to build a society in which public services are guaranteed as universal rights, to build an alternative water and energy system democratically owned and managed by the people.